We do not take the work of planning for our future success lightly. This new plan is the culmination of work done by a strong, active committee of 37 volunteers and staff facilitated for the seventh time by chamber volunteer leader Tim Hull. 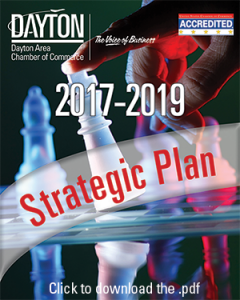 During the many hours of thought, challenge and discussion that took place in the spring and summer of 2016, we were able to garner insight and direction into five focus areas where our chamber can excel and be most effective. These areas came from surveying our members and prioritizing their needs. This roadmap for the next 3 years will only be successful with everyone?s help and support, and it will give us a path to a more prosperous business environment and community. Along the way the committee revisited our Vision, Mission and Core Values, challenging each so that we may stay relevant to our 21st century member. Our five strategic priorities position us to use our collective resources and the chamber’s size, reputation and work ethic to achieve those important priorities that can lead to our shared success. We encourage you to review our plan. We are very transparent about our plan because we want to share our ideas with our members, partners, collaborators and the public. This way, everyone will continue to see our focus and value to our community.